If you make a living landscaping, mowing lawns, caring for gardens, laying pavers, installing irrigation, or just making the world a cleaner and greener place, then you need to read this story. This could become the most important story for your future! From human resource challenges, to the Lithium Revolution, to using highly advanced mobile solar charging systems integrated into your lawn trucks, let’s take a look ahead. The number one problem (today) is finding, hiring, training, and keeping superstar employees. At least that’s the feedback we got when we surveyed just over 200 lawn & landscape business owners a few weeks ago. We had 72% of our responses COMPLAIN about employees! That’s too bad. Here’s a special message just for YOU! Welcome to the world of being an entrepreneur in an expanding economy! I’ve been an entrepreneur since 1987 (31 years as I write this article) and I’m proud of it! I consider this decision to be the most serious responsibility in life: becoming a life-long job creator! And…I get great pleasure in counting myself in the asset column on the balance sheet of America helping to create jobs and pay taxes along the way. Yes, there are hurdles along the way for entrepreneurs…like the challenge with employees today. But remember…Entrepreneurship creates HUGE upside opportunities! I believe that a HUGE solution to our labor problems (and much more) lies in adopting new technologies. Allow me to explain. About every decade or so, something happens that changes the game of business. Industries change. Best practices of the past become the hang noose of those stuck in the “old ways of doing things”. We are currently on the leading edge of such a change in the lawn business. Early adopters could make a fortune AND solve part of the labor problem along the way! Here’s a winning formula that will seldom let you down! One secret to becoming a winner in the landscape industry is your willingness to adopt new technology. This tactic gives you an instant competitive advantage. The zero-turn lawn mower, the dingo, the stick edger, growth regulators, slow release fertilizer, ride-on sprayer/spreaders, computers, software and even the Super Lawn Truck™ was once a brand-new idea for those making a living outdoors in the landscape. This NEW technology was introduced on late-night TV! A few years ago, with hardly any fanfare or publicity, a new company from China showed up in the USA with a brand-new lawn & garden tool. Rather than beg the big-box retail stores to give them shelf space and place huge burdens of price concessions on their product offering, they used direct response marketing to show this new tool! The year was 2007 and a late-night TV infomercial introduced a battery powered string trimmer called the Worx GT™ to USA consumers. After a couple of years, they had sold 313,000 of their string trimmers using this approach! Now…the big box retailers WANTED WORX™ in their stores. 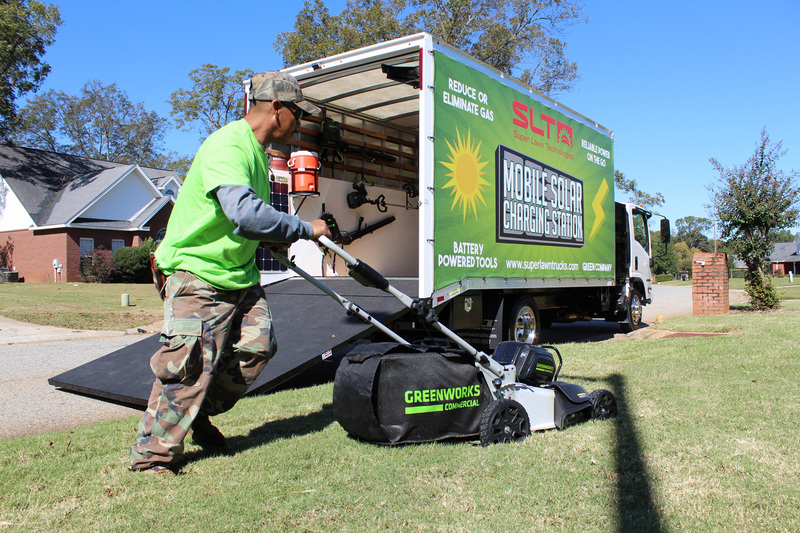 The WORX™ product became a HUGE success and the battery powered hand-tool revolution for the lawn industry was underway! But very few lawn or landscape pros bought this powerful new tool. Why? You could argue the tool that WORX™ introduced to the USA consumer was not heavy duty enough for daily commercial use. After all, it was very lightweight and made of mostly plastics. But the biggest reason was crystal clear. The battery only lasted about 15 minutes. No one would be able to make a LIVING using this battery powered hand tool with a battery that was dead after 15 minutes! But technology did not stop advancing! Nope, battery life and battery technology just keep getting better and better. Over a 5-year period, the battery life has DOUBLED! Once again, commercial contractors were not impressed. They did not buy the new technology found in the little WORX GT™ product. But a host of commercial minded power tool companies took notice of what had just happened, and a brand-new category of battery powered hand tools began to emerge from the R & D departments of well-known national brands like DeWalt™, Stihl™, Husqvarna™ and more. Fast forward to 2017 and take a walk around the floor of the world’s largest show for lawn equipment, the Green Industry Expo… Electric powered power tools are everywhere! I had one attendee suggest they rename the event to The Lithium Show! Will gas-powered lawn & garden hand tools become the next 8-track, cassette tape or Blackberry device? You must understand. The guys who build gas powered engines for lawn and garden tools can’t get real excited about competing (or creating) with a NEW solution for their product line. After all, gas powered garden tools have been generating hundreds of millions of dollars in annual sales for decades. This NEW idea of a battery powered future could KILL their ecosystem! This would wipe out jobs and end careers of entrenched manufacturers, distributors and dealers alike. So (it appears) the biggest names in small gas-engines have sort of played a wait-n-see kind of approach. They’ve introduced a few new tools of their own…but just a few. They certainly haven’t taken a leadership role in introducing new technology. No company CEO wants to be the next Kodak! You remember them? They were the 100-year-old company with headquarters in New York state that went bankrupt when the digital camera invention eventually replaced their line of cameras, film and print products. The company became a case study that haunts every CEO. You simply don’t want to be the guy who could not see change coming! Back to the lawn and landscape story. Slowly and steadily, new brands are emerging. Just like Tesla has emerged as a relatively NEW car manufacturer, you now see new brand names in our industry that bring battery-powered tools to us. These names might be new to you: GreenWorks™, EGO™, Mean Green™ and many more. They have one thing in common. They manufacture battery powered equipment heavy duty enough for commercial applications. These new names to the commercial landscape industry are not burdened with an entrenched eco system stuck in decades of tradition. These players don’t necessarily play by the same old rules of manufacturer – distributor – dealer – end user hierarchy. These guys have invested millions and millions of dollars with the goal of disrupting the tradition of gas-powered garden tools. Personally, I think it’s going to be very hard for you to ignore this new technology for very long. Four things you need to know to profit from the Lithium Revolution! Gas Powered String Trimer operated for 500 hours – using ¼ gallon of gasoline per operating hour- with fuel at $3.00 per gallon – it uses 125 gallons of gas – which costs you $375/year. Battery Powered String Trimmer operated for 500 hours – will require approximately 650 recharges – that use .2 of a kilowatt of electricity per charge. With a national average of .11 cents per kilowatt, this tool’s fuel bill will cost you less than $20/year. That’s 1775% LOWER fuel cost! But the biggest positive impact for your company is NOT the fuel savings! The BIGGEST impact comes in two powerful benefits that make your business more profitable and much easier to operate. Reduced repairs and maintenance. Parts like carburetors, pull cords, air filters and spark plugs will be gone, gone, gone! And…mixing oil and gas is gone too! Easier to find employees. I predict the easy-to-use battery powered tools will open our industry to a NEW type of employee. An employee that appreciates equipment that starts as soon as you pull the trigger! Gone are the days where we must find mechanically minded technicians who can fix or repair equipment in the field! Disruptor warning: Failure to adopt this new technology could CRIPPLE your business! Early adopters could crush you with lower operating costs, providing lower prices for customers and gaining easier access to employees. That’s the bad news. Lucky for you…there’s some good news. You can become the disruptor if you have the courage to become an early adopter yourself! Batteries don’t last all day. The automotive industry calls the reluctance to purchase electric powered cars “range anxiety”. It’s the fear of running out of battery power – fuel – while you’re on the road. And in our research with lawn and landscape business owners, they’re worried about the exact same problem: “range anxiety”…or battery power limits. And when you look at these lithium ion batteries – OH BOY – they ain’t cheap! Fortunately, there’s technology available today that allows lawn and landscape contractors to re-charge batteries on the go using FREE CLEAN SOLAR ENERGY. At the Green Industry Expo 2017, contractors and battery powered equipment manufacturers stood up and paid careful attention to this game-changing technology. Because the ONE problem the battery powered equipment manufacturers haven’t been able to solve to date is – on the go charging. Over a two plus day event, hundreds of lawn and landscape business owners came by to see what we have invented. We’re happy about the interest! And, there’s a list of technical hurdles I could share with you to answer the question, “Why this hasn’t been solved on a scalable basis?” But I’ll leave that to a future conversation. But what I can say is this. As the founder and CEO of Super Lawn Trucks, we are prepared to make mobile solar powered charging for battery powered tools reliable, easy to use, affordable and easy to purchase. So, if you want to learn more about the revolution to move away from foreign oil and towards clean solar energy for battery powered hand tools, just visit www.solarlawntruck.com/about-us. Tony Bass is the founder of Super Lawn Trucks, co-author of The E-Myth Landscape Contractor & he has been awarded three US Patents for technology to advance the lawn and landscape industry. Email Tony at tony@superlawntrucks.com and his phone is 866-923-0027.